REACT EMS is proud to recognize Galen Hankal as a Star of Life 2017. Galen is a Field Supervisor and Paramedic for REACT. With 11 years of experience, Galen is a true leader to all personnel and a reliable leader on the most challenging calls. 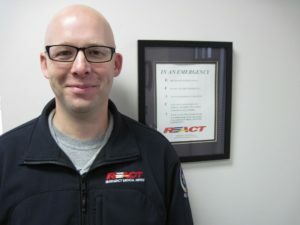 In addition to his daily duties, Galen is the primary leader to manage and help EMTs and Paramedics looking to join our REACT Team. Galen shepherds the applicants from the first visit through our testing and interviews to selection and orientation, preparing them to be strong assets to our mission. Galen and his wife, Lezlie, are the parents of Collin (9) and Liam (6). They are an avid baseball family and go fishing with the boys during the off season. Galen has always shown compassion for his patients and the patients of his crews. Recently, Collin was injured in an ATV accident while visiting at his grandparents’ home. Suddenly, Galen and Lezlie were the family of an EMS patient. Collin was rushed to a rural facility and soon transported by air EMS to the Childrens’ Hospital for his internal injuries. Collin recovered completely, but it was a challenging experience for the whole family. Galen values the role of out-of-hospital providers even more, and his compassion for the families of our patients is even stronger. Galen is an excellent example of the great EMTs and Paramedics working at REACT. Again, we are proud that Galen Hankal is our Star of Life for 2017.